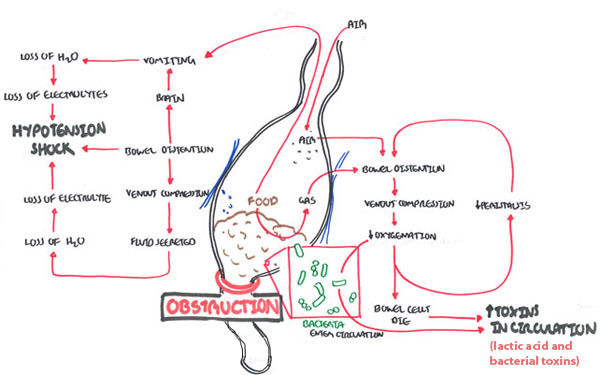 Cardinal features of bowel obstruction present? Absence or presence of intestinal ischemia (simple or strangulated). Cardinal features of bowel obstruction? Is it a partial or complete bowel obstruction? Is it obstruction of the small or large bowel? Air fluid levels “Picture frame” appearance. Proximal distention + distal decompression. Remember Ileus is temporary paralysis of the myenteric plexus. Contents of the small intestine are acutely unable to transit because of impermanent neural or muscular inadequacy. Ileus Temporary paralysis of the myenteric plexus. Contents of the small intestine are acutely unable to transit because of impermanent neural or muscular inadequacy. Sudden and severe pain, nausea, vomiting, abdominal distention, and inability to tolerate a diet or to pass stools typically accompany ileus, but ultimately the condition resolves completely. Toxic Megacolon – defined by a diameter of the rectosigmoid region or descending colon on abdominal plain film of greater than 6.5 cm; an ascending colon diameter of greater than 8 cm; or a cecal diameter greater than 12 cm. Megacolon can be caused by aganglionosis (Hirschsprung’s disease), can be idiopathic (complicating chronic constipation of any cause), or may be a manifestation of a generalized GI dysmotility (intestinoparesis). Hirschsprung’s disease – (Paediatrics) The most common cause of congenital megarectum and megacolon.